Aaron Rutten has added another class to his list of classes at the Digital Art Academy. Advanced Landscape Painting offers advanced painting techniques with step by step video lessons you can pause, rewind and watch on your schedule. Discover how to paint a variety of landscape elements such as sunsets, waterfalls, starry skies, clouds and rain. Students will master the skills needed to compose detailed landscape paintings from imagination without having to rely on copying a photo or cloning. Included in the class is a custom workspace, which when loaded into Painter X3 has all the brushes and tools required for this class. Using the custom workspace makes it easy to follow along with the lessons. This class builds on Aaron’s previous class, Fundamentals of Landscape Painting. Advanced Landscape Painting is an “Open Enrollment” class, which means that the student can enroll any time and work at his or her own pace without a time limit. Follow the link for Advanced Landscape Paintings and learn all about Aaron’s class. While browsing, check out the rest of the classes at the Digital Art Academy. Here are examples of some of the types of landscapes that Aaron will teach. This entry was posted in 2014 Corel Painter Posts and tagged Aaron Rutten, Corel Painter X3 Instructions, Corel Painter X3 Tutorials, Digital Art Academy, Video Corel Painter X3 Classes. Bookmark the permalink. 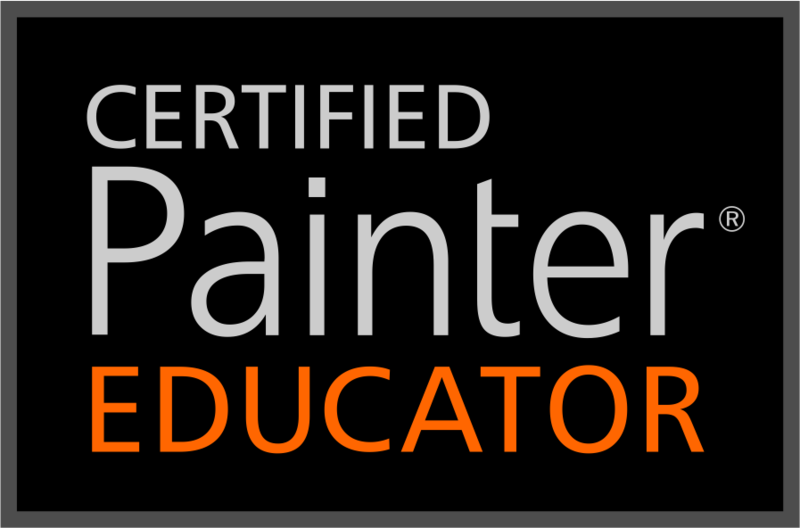 The Best Corel Painter Brush Class Available…Definitely take this one! Also a bit about the Well and Color Expression Panels. Wacom Posted New Tablet Drivers for the PC on April 28th. I Missed It! Good recommendation, Skip. I have enjoyed several of Aaron’s short Youtube tutorials and I like his methodical painting methods. Thanks Wardie…I think his approach is interesting. Lets say you want to incorporate a bird from one picture into the sky of another. The bird photo is smaller that the main image and the bird fills the frame. if you brought it in as it is it would be out of scale. My solution: If you open the bird picture and ‘Select All’. ‘Copy’ that and ‘Paste’ it to a fresh New canvas – where it will come in as a layer. Then use Layer Adjuster and Free Transform to shift it to where you want to place it, scale it to a smaller size and even rotate it. Then Drop it to Canvas and Save. If you want this could be a good place to also change the resolution to the same as the main image. Then it is easily brought through as a Clone reference for the main image. You should be able to make a comment on the You Tube video, but making a comment anywhere on my blog will get to me as well. Excellent post. In Painter, there are multiple ways to do the same thing. I’m not sure that I remember the video…LOL. I think you suggestion is excellent. I can give you another way to do the same thing you are doing, but even easier. Instead of doing a copy go to File > Place and open your bird image. This will bring the image in just like a copy…on its own layer. You can still do all the adjustments that you made. Thanks for the post and for visiting the blog.